Truly great holiday marketing isn’t about trying to invent a flimsy link between whatever you’re trying to promote and the holiday of your choosing. Consumers are already bombarded with enough holiday advertising everytime they turn on their television sets, open up social media apps on their smart phones or launch their internet browsers. With so much holiday advertising doing the rounds it takes something pretty special to stop people in their tracks. 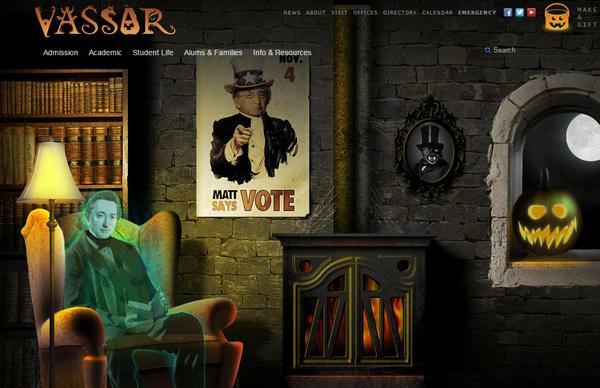 Vassar College has done just that with their spook-tacular official Halloween home-page takeover. Just look at it! Take a moment to let its impressiveness really sink in. This is such a creative, fun and fantastically whimsical idea that’s sole purpose appears to be bringing fun and a little Halloween spirit to the Vassar masses. With a campaign such as this one, you might be wondering what the goal is or if there is any direct ROI. If you are, you’re right in a way, there is no direct ROI with a campaign like this. There’s no clear campaign message that drives visitors to carry out a quantifiable action (although we can’t say we’re not impressed by the pumpkin bucket featuring a clever ‘make a gift’ link). The real merits of a campaign like this one come from how memorable it is and the positivity that it generates. Consider a prospective student who happens to log on to the Vassar website on Halloween; chances are they’re going to remember the experience in a positive way. The same goes for current students and alumni members. The real lesson here is that marketing can be subtle and still be effective. A campaign that’s creative, original and that brings a smile to people’s faces can go a long way when it comes to positively reinforcing your university or college’s brand. Vassar College do Halloween homepage takeovers every year so make sure you check out the graveyard (archive) of their previous ghostly incarnations. What do you make of Vassar’s campaign? Let us know in the comments below. Oh and happy Halloween from all in TERMINALFOUR!